Everybody wants to have a picture perfect smile, but sometimes people have to undergo cosmetic or restorative dental procedures to achieve the smiles that they want. In some cases, some of your teeth may have decayed over time, and in other cases, your natural tooth might be healthy, but it might not have the straight look and appearance that you want it to have. Regardless of your particular dental condition or the reason why you want to seek cosmetic or restorative dental treatment, one of the most common ways to help patients achieve the smile that they wish is with dental crowns. Dental crowns are tooth-shaped dental prosthetics that are placed over your existing tooth. 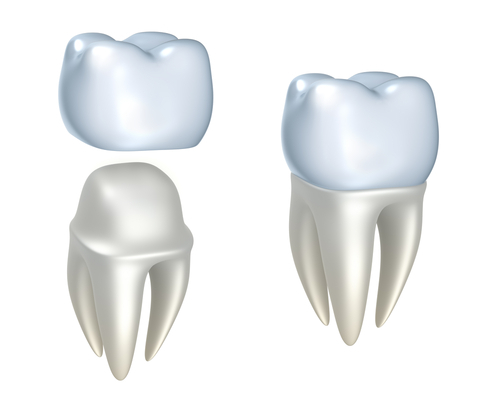 They essentially “cap” your natural tooth, which is why sometimes they are referred to as “dental caps.” In most cases, dental crowns have the look and appearance of a natural tooth, and they completely cover your natural tooth from the gum line up so that the decayed or misshapen tooth cannot be seen. Dental crowns actually protect the tooth underneath them from further decay if they once had a cavity or other dental issue affecting them. The most common reason why many people choose to get dental crowns is to enhance the appearance of their teeth. For instance, people who have chips in their teeth, have misshapen teeth or have severely discolored teeth that cannot be sufficiently whitened with a professional whitening treatment oftentimes elect to have dental crowns placed over the offending teeth to give the illusion of straight, white, perfect teeth. However, there are plenty of other instances when dental crowns might be needed as well. In addition to having dental crowns placed for aesthetic reasons, people might also need them placed to protect a tooth that has been so severely decayed that there isn’t much left to the tooth or that are so decayed that they are in danger of breaking off or decaying further. Furthermore, when people have cavities that require extremely large fillings, their dentists might recommend that they have a dental crown placed over the tooth to help keep the filling from falling out of the tooth. Likewise, in cases where people have to have a tooth extracted or never had a tooth in a certain place to begin with and had an implant placed in the area, a dental crown will be needed to cover the metal stud that is the implant. The process to get a dental crown placed usually requires two separate visits to the dentist. During the first visit, the dentist usually examines the tooth in question to determine that a crown can indeed be placed atop it. Dentists have to ensure that the teeth they’re planning on placing dental crowns on are stable enough to support the crown. Otherwise, the crown will end up breaking or falling off prematurely. Once it’s been determined that the tooth can support a dental crown, then the dentist will usually begin filling the tooth down in preparation for the crown. Once the tooth is sufficiently shaped and filed, then the dentist will take an impression of the tooth as well as the teeth adjacent to it before sending that impression off to a dental lab where a permanent crown will be fashioned. In the meantime, most dentists will place a temporary crown over the tooth that will protect it until the permanent tooth comes in. Once the permanent crown arrives, the dentist will schedule another appointment for the patient. During this second appointment, the temporary crown will be removed, and the permanent crown will be fitted over the tooth. Once the permanent crown is appropriately positioned, then the dentist will use a special adhesive to cement the crown into place. Patients should be cautioned that it might take a bit of time to get used to the feeling of the permanent crown within their mouths, but after a few weeks, the crown should not only feel like a natural tooth, but it’ll also provide them with the look and function of a natural tooth as well. Colgate. “Your dental crown procedure: What to expect.” Retrieved on June 8, 2016, from http://www.colgate.com/en/us/oc/oral-health/cosmetic-dentistry/bridges-and-crowns/article/your-dental-crown-procedure-what-to-expect-0113. Mouth Healthy. “Crowns.” Retrieved on June 8, 2016, from http://www.mouthhealthy.org/en/az-topics/c/Crowns.